Dental composite resins (better referred to as "resin-based composites" or simply "filled resins") are types of synthetic resins that are used in dentistry as restorative material or adhesives. Dental composite resins have certain properties that will benefit patients according to the patient's cavity. 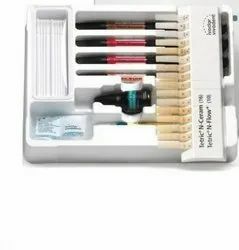 - set of 10 pcs. .
- 3 tools for Home Dental Care: made of Surgical Steel; Packed hygienically. - Dental Mirror: To catch that budding gum inflammation, early decay or tartar build ups. - Sickle Scaler: To help reach out to early plaque formation and remove it before hardening. - Tongue Scraper: To Cleanse the bacteria and mucus from the tongue to maintain dental hygiene. INSIDE BOX 1 TOOTH BRUSH 1 PASTE. Fusion Universal is visible light cured, radiopaque highly filled, nano filled hybrid composite restorative material for all cavity classes of anterior and posterior teeth. 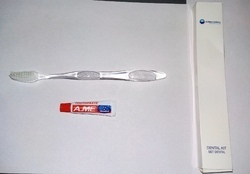 The dental kit is available in varying packagings-Ecofriendly Non woven fibre , Imported Mirrorcoated Paper box or a Plastic Pouch packaging printed with hotel logo in 1 colour. Our Company is engaged in providing Office Bleaching Materials to our clients. Keeping track of the latest market developments, we are supplying a range of Dental Kit. Offered kits are manufactured by using the finest quality raw material and innovative technology in sync with set industry norms.